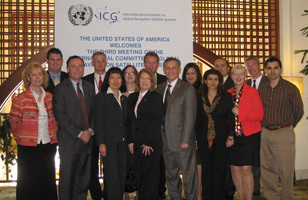 The following presentations were delivered by the U.S. delegation at the third annual meeting of the International Committee on GNSS (ICG), hosted by the U.S. Government in Pasadena, California. This combined presentation includes four sections covering: U.S. space-based PNT policy implementation; GPS technical information and modernization plans; U.S. augmentation systems; and U.S. efforts to detect and mitigate interference to space-based PNT systems. This presentation from the December 9 "GNSS Science and Technology Applications" session descsribes GNSS use in the U.S. Geological Survey's (USGS) science applications, with emphasis on the USGS Earthquake Program's precise GPS applications. 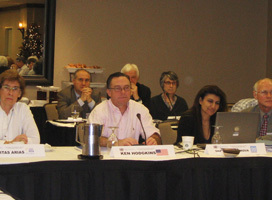 This briefing presents U.S. views for ICG Working Group "A" on Compatibility and Interoperability. It proposes that the ICG adopt a new principle on GNSS service assurance. This presentation discusses potential use of multiple GNSS constellations to support global aviation safety. This presentation from ICG Working Group "C" on Information Dissemination proposes the development of a standardized glossary of GNSS-related terms. This presentation from ICG Working Group "C" on Information Dissemination describes cooperative efforts under way through APEC's GNSS Implementation Team.